﻿Over the last three decades, there has been growing recognition for the role of gut bacterial in the health of the gastrointestinal tract. It has been found that anywhere between 17 - 85% of cases of irritable bowel disease may in fact be attributed to an underlying overgrowth of bacteria into the small intestines, called SIBO (small intestinal bacterial overgrowth). It is important to note that this is NOT an infection, but an overpopulation of bacteria in a location not meant for such high concentrations. 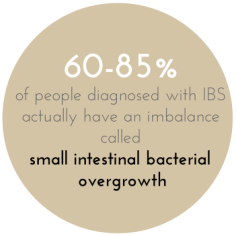 The small intestine's role is primarily that of nutrient absorption, and therefore overgrowth in this area allow the bacteria to rob you of essential nutrients. Vitamin D, K, iron and b12 deficiencies are popular among these patients. The inflammation produced by the endotoxins of the bacteria are also an attributing cause to leaky gut syndrome and the development of multiple food sensitivities. Furthermore, SIBO can inhibit nutrient absorption and lead to carbohydrate intolerance, malabsorption/malnutrition, anemia, weight loss, and so on. Bacterial imbalanced can also change the way hormones are metabolized and excreted, and have been correlated with acne, irregular periods, and other hormonal issues like adrenal fatigue. Patients with gastrointestinal distress may benefit from SIBO testing, especially those with a history of chronic constipation, diarrhea, weak stomach acid, or generalized maldigestion. Successful eradication of SIBO has been shown to significantly reduce bloating, gas, diarrhea, and abdominal pain in patients. Gold Standard for diagnosing SIBO involves a Lactulose Breath Test, where a lactulose substance is administered after 24 hours of a non-fermentable diet. Breath samples are assessed every 20 mins for 3 hours following administration of the substance, and hydrogen/methane gas is measured in each sample. A steep rise or overall elevation of either of these gases indicate that bacteria is fermenting the sugar, and is deemed positive for SIBO. Treatment with Dr. Holmberg, ND involves a series of steps to ensure complete resolution of the overgrowth. The first step involves resetting the terrain of the digestive tract utilizing natural or pharmaceutical antimicrobials in combination with dietary and nutraceutical therapies to repair the gut and minimize risk of recurrence. Remember... the bacterial strains in our guts are not just a collection of individual organisms, but an ecosystem that operate as one! Once the terrain reset and repopulated, associated conditions that may have been attributing to symptoms are then address, all while ensuring chance of recurrence is minimized. The goal of treatment is to address the underlying overgrowth and resolve symptoms for good.